What’s in this month’s blog……. First stop was Sydney for the Low Carb Down Under Sydney show run by doctors Doron Sher and Paul Mason. Great line up of speakers, packed house at Sydney Uni and a great dinner afterwards. Always a joy catching up with Gary Fettke and Maryanne Demasi. Sold lots of books too. Next was another trip to Sydney to have lunch with Sami Inkinen. A long way to go for lunch you might say, but Sami is pretty special. Click this link to have a read of this article from Forbes. 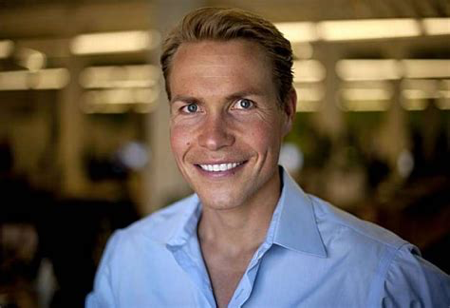 Sami is a hugely successful entrepreneur businessman (Trulia.com), a world champion ironman triathlete, and the star of the movie Cereal Killers 2 in which he and his wife Meredith rowed a boat from San Francisco to Hawaii in record time on a low carb high fat diet. Here is the Cereal Killers 2 trailer. Worth watching the whole thing if you haven’t already. Sami’s current project is Virta Health which is a online program to reverse Type 2 diabetes without the use of medications by focusing on diet and lifestyle. Low carb pioneers Steve Phinney and Jeff Volek (pictured) are involved as well as Sarah Hallberg who has an outstanding TED talk with 3.4M viewers here. Virta has been going for a couple of years now and initial results are very impressive. The Virta studies are highlighted in this month’s medical journal articles later in this blog. Then it was on to Europe. I have been to hundreds of conferences in my medical career, but I have never experienced anything like what I witnessed at the Public Health Collaboration conference in London recently. 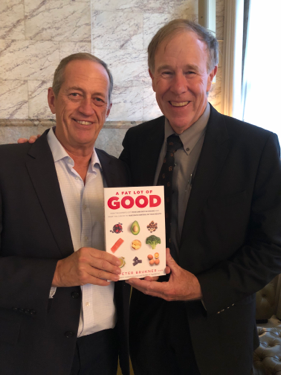 Professor Tim Noakes, the South African who has, more than anyone else, influenced people around the word to abandon the low fat way of eating and adopt a low carb healthy fat lifestyle, or as the South Africans call it, the Banting Diet was one of the invited speakers a the conference. For the past couple of years Tim has been involved in a ‘trial’ after he was accused of giving misleading advice over twitter some years ago. He has been the subject of a bitter, nasty campaign to discredit him led by the dietitians and certain medical practitioners in South Africa. Tim was found ‘not guilty’ at his trial, but the prosecution appealed the verdict. The appeal was held in February this year and at the time of the conference we were still awaiting the result. I gave the opening address of the conference held at the Royal College of general Practitioners in London and was asked to give a “State of the Nation’ address updating the audience on what had been happening in the low carb world in th previous 12 months. 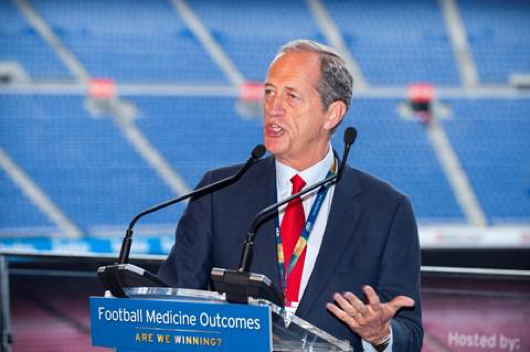 I presented the more important research papers that had been published since the 2017 meeting and then concluded by saying how fortunate we were to have a number of low carb ‘heroes’ speaking at the meeting including Sam Feltham, Zoe Harcombe, Aseem Malhotra and David Unwin. Then when I spoke abut our ‘superhero Tim Noakes’ the audience as one stood up and gave him a standing ovation. Amazing! Tim gave his keynote address on Sunday morning and took the audience on his journey of the last few years. It was a dramatic, emotional story and he had the audience spellbound for over an hour. The Liverpool born and bred Professor finished his talk by playing the Liverpool football cub anthem ‘You’ll Never Walk Alone’ which was an appropriate theme for his struggles. As you can see from this brief video excerpt, for the whole three minutes of the song, the audience gave Tim a standing ovation. It was incredibly emotional and I doubt there was a dry eye in the house. Have a listen. I have never witnessed anything like it at a conference. Tim was responsible for getting me started on my low carb journey and this is what I say in the ‘My story’ section of the book …. Soon after that birthday, I read something from my old friend and colleague Professor Tim Noakes, who is generally considered to be the pre-eminent sports scientist in the world. Tim had started advocating a low-carb diet without the usual restrictions on fat. He was on this diet himself with dramatic results, and was encouraging others, including athletes, to adopt it too. Tim is a lateral thinker who constantly challenges the orthodoxies of sports science. He wrote Lore of Running, a massive tome that’s essential reading for any serious runner or sports scientist, and has fascinating thoughts on a whole range of topics (including cricket and Bradman’s backlift!). So when Tim Noakes comes out and states categorically that everything we believe about diet, obesity and heart disease is wrong, we all need to sit up and take notice. But surely, I thought, the medical, nutrition and sports science community could not have been so far off the mark for all these years in advocating a diet low in saturated fat (to prevent heart disease) and high in complex carbohydrates (to fuel exercise). And yet that’s exactly what Noakes was saying. He even apologised for advocating a high-carb diet in Lore of Running – no doubt he will change that for the next edition. Tim’s conversion certainly got me thinking. I wanted to find out more. And here we are with a certain book ….. Some of the heroes are shown here – Aseem Malhotra, Zoe Harcombe and David Unwin. David’s wife Jenny is trying to work the camera and my friend Karim Khan, the editor of the British Journal of Sports Medicine has photobombed in! And then just last week, the verdict of the Tim Noakes appeal hearing was finally announced and Tim was completely exonerated (again). Here are two excellent descriptions of the whole saga, the first from Tim’s co-author in the Lore of Nutrition, Marika Sboros and the other from Nina Teicholz – both worth a read. 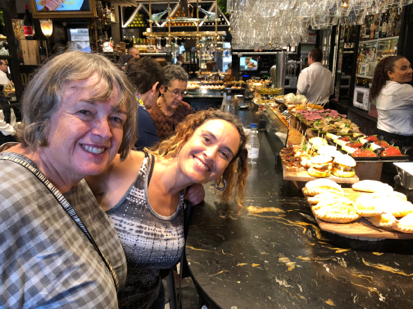 The area is famous for its food and wine and we got into the local version of tapas the pintxos – going from bar to bar and tasting the delicacies laid out on the bars. From Bilbao it was a short train trip to San Sebastian a lovely old town also full of interesting bars and restaurants. Unfortunately it rained most of the time which restricted our moving around during the day but not our dining at night. Also got to watch the Champions League final in a bar full of fellow noisy Liverpool supporters – they don’t like Real Madrid in that part of Spain. Wrong result regrettably but a great atmosphere. 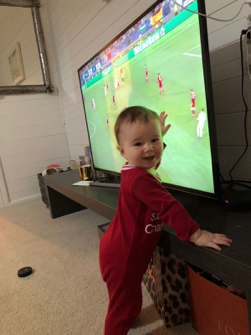 It was good to see my grandson Teddy was up early at home to watch it as well in his Liverpool onesie! Next we spent a few days in a small clifftop village called Alquezar, halfway between San Sebastian and Barcelona. Spectacular place with some great walks along the flooded river. 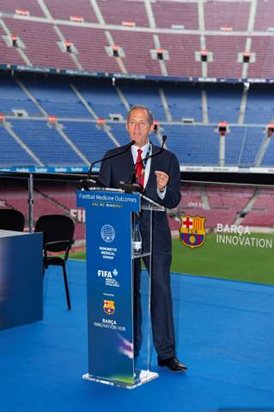 Then to Barcelona wearing my sports medicine hat for the Football Medicine conference, 3000 delegates from 90 odd countries coming together at the magnificent Camp Nou stadium home of the famous Barcelona Football club. Our sports medicine textbook is always popular at these conferences and Karim and I spent lots of time signing copies and having photos. Then it was time to go home and enjoy some time in Melbourne before heading back to Europe in July. Now I don’t want you to think I am at home twiddling my thumbs. The weekend after returning from Europe I was keynote speaker at the Massage and Myotherapy conference on the Gold Coast. Spoke about nutrition up there as well, as massage therapists can play a very influential role in improving their clients’ health. I also had the chance to speak to a group of GPs at a Primary Health Care clinic in Werribee, a suburb in Melbourne’s west. My book has been out for a few weeks now and seems to be selling well. The publishers have already ordered a reprint so I guess that is a good sign. 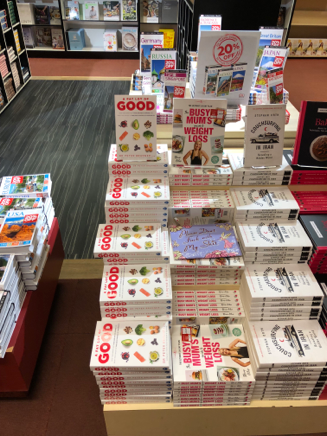 I have been signing books at various bookshops around the country and it has been pretty prominent in most of them. I even snuck into the top ten best sellers section ….. and then two weeks later up to No 8 !! Have continued to do plenty of media appearances the latest being on ABC radio Melbourne with the brilliant Lindy Burns. The station received a massive response to posting the interview on Facebook and Lindy has changed her eating habits as well and tells me she is loving it. Usman has been on a healthy real food diet for the past six years. A number of people have been enquiring how best to obtain a copy of the book if you are out of Australia. The best way is to go on to the Book Depository website and order through there. They offer free postage. Book reviews for A Fat Lot of Goo dare starting to roll in. Here is one from Brisbane. It starts like this …. 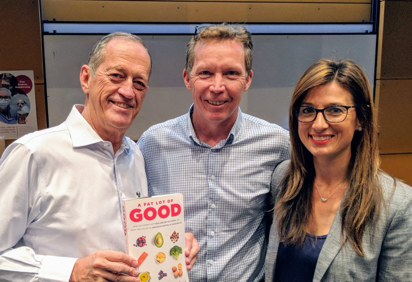 A couple of years ago Auckland Professor of Public Health Grant Schofield along with dietitian Caryn Zinn and chef Craig Rodger put out an excellent book about low carb eating called What the Fat. It is one of my favourites. Well they have done it again. This time a similar book about fasting called, very cleverly, What the Fast. Both these books are a nice mix of science and recipes. That’s Libby next to the copy of A Fat Lot of Good with Grant Schofield behind us. Libby Jenkinson is a pharmacist and mother of three who had always struggled with her weight until she discovered LCHF eating. She started a small website as a part time hobby three years ago and it has been a huge success – 1 million visits a month. That Iis a mind boggling figure. It really is a fantastic site. If you are a parent struggling to think of good ideas for your childrens’ meals then this is the site for you. Pete Evans doco/movie The Magic Pill has certainly been in the headlines recently. Well I think the movie is great. It is entertaining, informative and sends the right message. I suspect Dr Bartone has not actually watched the movie – if he had, he would have been impressed. There are a lot of people who love to criticize Pete Evans, but as far as what food we should be eating, he is pretty much spot on. It is interesting that doctors and dietitians don’t like anyone else commenting on food health issues. Medical arrogance I call it. Most doctors know absolutely nothing about nutrition – if they did they would not have gone along with the food and pharmaceutical industries’ promotion of a low fat diet for the past 40 years – a diet which has had disastrous consequences for us all. Make up your own mind – have a look at The Magic Pill on Netflix. I love Greek yoghurt. I have it most days, often with my mixture of nuts and seeds along with some berries. A great morning meal. 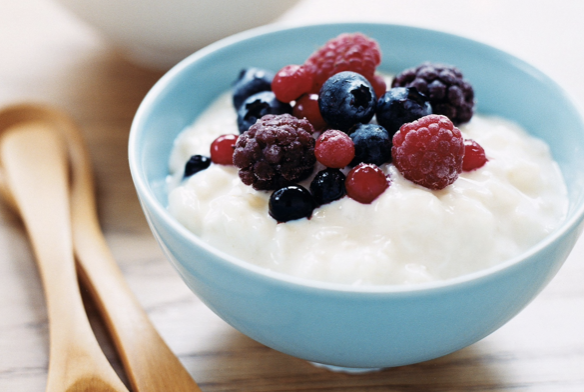 A year or two ago it was hard to find a full fat Greek yoghurt in the crowded yoghurt section of your supermarket – all the yoghurts were low fat and many of them were ‘fruit yoghurts’ – all of which have high levels of sugar. But recently there seems to have been increased demand for full fat Greek yoghurts and they are not so hard to find. Make sure you get a full fat Greek yoghurt not a low fat or ‘lite’. What do I look for in a Greek yoghurt? Well once I am satisfied that they are full fat, I check that there is no added sugar – the sugar content should be no higher than 5 or 6 grams per 100 mls which is the amount of natural sugar (lactose). Anything more than that probably has some form of added sugar. I also look for flavor and texture. Choice recently published a good review of Greek yoghurts and tested 23 different ones. Here is the link to the Choice article with a spreadsheet comparing nutrient values. They ranked three yoghurts highest for taste - Coles Greek Style Natural Yoghurt, Farmers Union Greek Style All Natural Yogurt, and Tamar Valley Greek Style All Natural Yoghurt. I tend to agree. I mainly use Tamar Valley but I am more than happy with the other two choices. My wife is a big fan of the Farmers Union brand. Earlier in this blog I mentioned meeting up with Sami Inkinen the founder of Virta Health. Virta which is an online program to reverse Type 2 diabetes has recently published its first 12 month results and they are worth a close look. As you can see they have pretty impressive reductions in all these parameters – weight, diabetes control, insulin resistance, use of medications etc. Each month I intend to publish as story from one of my readers, so please send us your stories. They are inspirational. I have struggled with my weight as long as I can remember and have been a yo-yo dieter for most of my adult life (and yes there are very few diets I haven't tried, had a measure of short term success with and then failed). I wanted to find a way to be "healthy" but always found myself falling off the bandwagon and putting all the lost weight, and usually more, back on. From my mid to late teens onwards I had issues with abdominal weight, irritable bowel, irregular menstrual cycle, hair loss, depression and yet was never thoroughly investigated. A series of events after moving to Australia led to me being diagnosed with Autoimmune hypothyroidism, insulin resistance, non alcoholic fatty liver disease and PCOS. I knew my lifestyle was the main problem but felt powerless to consistently change my way of living, instead giving in to huge carb cravings and feeding what had become an incessant appetite. In addition to the above issues I increasingly experienced bloating, fatigue and physical pain in my joints and back. As a health care professional I was all too aware of where this road was taking me and I was becoming desperate to change direction. Fast forward to January of this year, I was the heaviest I'd ever been at 100kg and my blood tests weren't painting a pretty picture; they were a bit of a slap in the face to be honest- definitely a wake-up call!!! I decided to go back (yes this was my 2nd attempt) on a ketogenic way of eating. Just after that decision I came across exogenous ketones and decided to use them to help the transition my way into ketosis. I love the keto way of eating, after all what's not to love about meat with creamy homemade sauces and vegetables dripping in butter!!!! So for me I've never struggled with the concept of adding the fat, reducing carbs has been my challenge. Very quickly I noticed I wasn't feeling hungry as often so I started intermittent fasting (minimum of 16 hours in every 24) and for me that has been the most positive change. I only eat when I'm hungry and no longer because it's lunchtime or dinnertime. What changes have I seen in the last four months? I sleep better, have more energy, the brain fog has gone, I have seen improvements in my memory and focus, I no longer have a constant background level of pain and the bloating has gone. A few weeks ago I found myself wanting to exercise!! And then there's the weight loss, currently sitting at a 21kg weight loss in the last 3 1/2 months. Have I arrived? No! But I am enjoying this new road I am travelling and the people who have joined me along the way! That’s it for this month. I am going to try and blog more frequently (and shorter) in future, so stay tuned.